Hi friends Facebook is probably the most used app on iPhone, iPad and iPod Touch around the globe. Facebook app for iPhone has just upgraded to version 3.4 with a lot of bug fixes and much improved User Interface for Notifications. 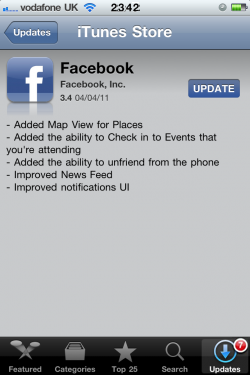 This app also adds numerous new features including Map View for Facebook Places, ability to unfriend, and the ability to check-in to Facebook Events that you might be attending. this version has also been tested on iOS 4.0 and above. What's New in Facebook Version 3.4? 0 Respones to "Download now Facebook version 3.4 for iPhone, iPad, iPod touch"